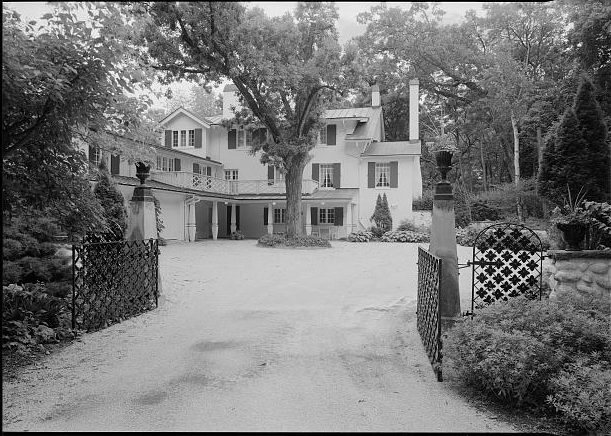 Home to world famous theater couple Alfred Lunt and his wife Lynn Fontanne, Ten Chimneys earned National Historic Landmark status in the early 2000s. Lunt, a Milwaukee native, bought the site in 1913 and began building the house a year later. The Lunts brought in famed theater set designer Claggett Wilson to paint elaborate murals on the walls and ceilings. They hosted a number of world renowned celebrities at Ten Chimneys, including Noël Coward, Sir Lawrence Olivier, and Katherine Hepburn. Threatened by land developers, the property was saved by local arts and preservation advocates in 1996. Now administered by the Ten Chimneys Foundation, the house and grounds serve as a museum and as a venue for public programs, specialized theater events, arts education programs, acting workshops, and lectures. ^ Robert Simonson, “Lunt and Fontanne’s Most Lasting Production,” The New York Times, July 13, 2003, accessed October 24, 2011. See also “Ten Chimneys,” National Historic Landmark Nomination. ^ M. Caren Connolly and Louis Wasserman, Wisconsin’s Own: Twenty Remarkable Homes (Madison: Wisconsin Historical Society Press, 2010), 270-276. ^ Ten Chimneys, “About the Foundation and Mission,” accessed July 6, 2016. Connolly, M. Caren, and Louis Wasserman, “Ten Chimneys.” In Wisconsin’s Own: Twenty Remarkable Homes, 267-278. Madison: Wisconsin Historical Society Press, 2010.